New City, it's the city that never sleeps. The city where dreams are made - and where a trip is 'always a good idea'. In other words, it's a destination that is on every keen traveller's bucket list and on mine in particular, it took precedent over every other place in the world. For some reason or another, every trip I'd planned in the past hadn't quite come through and so with a week free in September, I decided to do possibly the craziest spur of the moment thing that little old sensible me has ever done. I booked my first ever trip to New York, on my own. Yes that's right. I've never been anywhere on my own before (at least not transatlantic) but I decided to head over to the big apple, sans companion. EEK! And I'm not going to lie, I was bloody terrified. But hey, I've lived to tell the tale - and so I thought I'd put together an ultimate guide, just in case you're heading stateside yourself - or have a spontaneous moment like I did! I think the thing that astounded me most about Manhattan is just how much there is to do and get involved with. I visited for seven days and didn't even make a dent on the activity options available to me. Admittedly, as it was my first time and I was alone (although I did meet up with friends throughout my trip) I tried to visit a mix of typical tourist attractions and things that were a little bit different. For example I visited the Rockefeller Centre, Grand Central Station, Brooklyn Bridge and Times Square - however I also was very lucky to have a private tour around the offices of the New York Times, which not only has incredible views of the city from above - but also an entire gallery wall of all of their journalists who have previously won a Pulitzer Prize (spoiler, it's a VERY big wall). There are a huge number of shows, productions and galleries to visit. Unfortunately I wasn't able to fit any of these in during my trip, but I would absolutely love to try and see a production on my next visit! I've heard that School of Rock, Wicked and The Lion King are the ones to see! If you're working on a tight budget, I'd favour the less costly activities - which include a stroll through Central Park, getting lost in the craziness of Times Square, strolling along the High Line, snapping away the incredible skyline from Brooklyn Bridge and getting in touch with your inner Serena Van Der Woodsen at Grand Central Station! In fact, talking of Gossip Girl, there's even a bus tour that will take you to all the location hotspots. Just so you know, XOXO. Oh and before I forget, possibly the most exciting activity of all - which is pretty unique, was that I embraced my inner adrenaline junkie (I'm joking, there is no inner adrenaline junkie in my case, I was terrified) and booked a doorless helicopter ride experience over Manhattan. It was probably the most exhilarating, amazing, incredible experience ever - and I'd 100% recommend it, because it adds a whole new dimension to your trip. We booked through FlyNyon for the ultimate photo experience - and just a quick note before, make sure you wear shoes that cling to your feet, because otherwise they'll have to tie them to you to make sure they don't fall off! And it can get very cold and windy up there, so be prepared! I'm going to be totally honest with you here and maybe be a tad controversial. But I basically didn't eat much the entire trip. I feel like a bit of a rubbish blogger, having not been to many of the famed and much Instagrammed eateries (like the Egg Shop and the Cheesecake Factory). Manhattan is obviously renowned for it's incredible pizza and it's amazing food, so I feel disappointed to have had a bad experience personally. But I think being tired (as I was trying to fit in so much) combined with accidentally eating dairy on the first day meant that I had a very poorly stomach for the duration of my trip. If you do have intolerances, unfortunately it can be a little bit tricky to eat - as a lot of places sneak in dairy into things you're usually safe with. For example, my much loved guacamole (which I basically lived off in Miami) had sour cream or cheese mixed into it, in most places. So please do double check! However, I did manage to try a few places out and have a couple of my own personal recommendations. They aren't necessarily Instagram-worthy but they were fabulously helpful, polite and the food was incredibly delicious! Juice Generation - they have a lot of these all over the city and I was so grateful for the discovery, as they're basically 100% vegan/dairy-free and super healthy. The Acai bowl is great if you're on the go and want something quick and nutritious to take-away. They also do homemade juices, vegan strawberry pop-tarts, apple pies and cacao and matcha donuts! Morandi (West Village) - I visited this place with a group of friends on the first evening, it's essentially a buzzy Italian with a simple, but incredibly delicious menu and a team of extremely helpful and kind staff! It's also fabulous for brunch - and if you enjoy classic, hearty, flavoursome dishes with a cosy, intimate setting - you'll love this place! Chelsea Market - If you have a morning free and a big appetite, then take your own little foodie tour through Chelsea Market. It's essentially a HUGE street-food market, but it's much easier and calmer to navigate than most. Find filled pastas, cheese wheels, huge pizza slices and my personal fave - a Mexican/Asian fusion diner where you can try spicy tuna tacos and five-spiced guacamole. Plus don't miss out on the coconut cream frozen cocktails and mini soft scoop ice-cream! The Standard - I have to say, the service here was EXTREMELY rude, but the views and the setting more than make up for it. 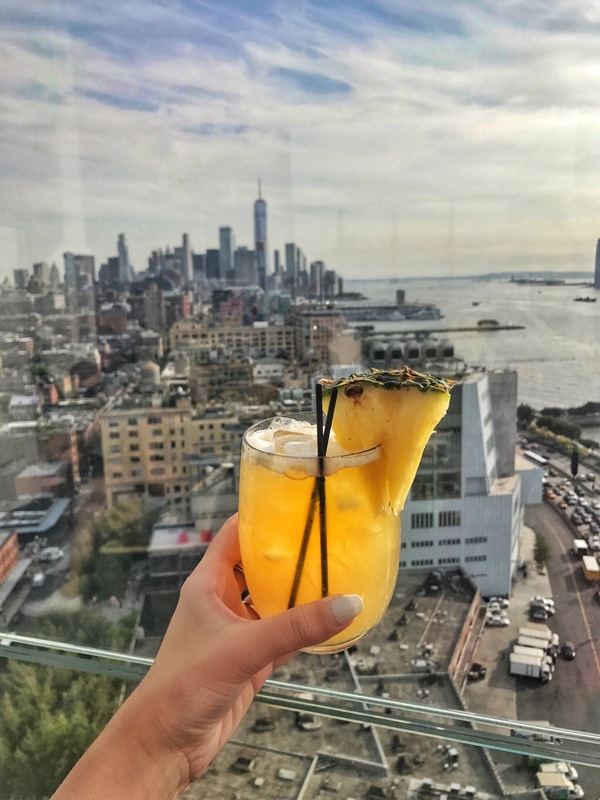 Grab a cocktail at their rooftop bar at the top and bask in the amazing panoramic skyline of the city. If you're less of a grandma than me, they have a nightclub on the floor below, which again has the same incredible views but it has an indoor jacuzzi next to the bar. So don't forget your swimsuit! Dos Caminos -If you're a bit of a Mexican cuisine fiend, then you'll love this place. I think it's possibly a chain, but it's a jolly good one and I'd whole-heartedly recommend it. The chicken and veg fajitas are pretty amazing (on par with some of the best I've had) and the guacamole is so fresh and delicious! The one on Times Square is not too expensive and the service is great. Rock Center Cafe - Situated right underneath the towering Rockefeller Centre, this sleek cafe has superb views and a really delicious, extensive menu. The portions are HUGE (I know NY is famed for this, but these are something else) and it's not ridiculously priced either. I'd opt for the sweet potato fries, frose (yep, that's frozen rose) and guac and chips. Let's get a collective, mmmm! I think one of the primary reasons I'd put off a trip to NY for so long was because it was always pitched as a really expensive place to get to. Renowned for its shopping (and let's just say, it didn't disappoint - stay tuned), it's one of those places you have to 'save for' in every aspect, one of which I'd figured would be the flights. However in recent years, flight prices to New York have become very competitive and it's not quite as expensive as it used to be. In fact, I'd go as far to say that it's VERY affordable. This has primarily been thanks to Norwegian, who are leading the world market in terms of low-cost transatlantic travel. Not only do they offer return fares starting from £259 between London Gatwick and JFK International Airport, but they fly a twice daily direct service operated by a fleet of swanky new Boeing 787 Dreamliner aircrafts. They also offer a Premium cabin (which I had the pleasure of trying out on my outbound journey) which is still very affordable (£419 one way) but offers that taste of luxury, with extra legroom, complimentary drinks and dinner, fast track security, lounge access and a seat you can pitch back to 46 inches (which is almost laying flat!). But possibly the BEST thing (and the most interesting), is the design of the new state-of-the-art aircrafts that Norwegian have built, as they are faster, greener and help reduce the effects of jet lag with their tried and tested cabin pressure, altitude and mood lighting. It all sounds a bit high tech, but I suppose all you need to know is that I arrived in NY feeling refreshed and ready to take on the day! Top tip: If you have an early flight time, make sure to book in your airport hotel or parking ahead of time to keep pre-flight stress at bay! Book quickly and easily through APH for the best deals, flexible bookings and no booking fees. Even if you're not addicted to shopping like me, then New York will definitely excite your inner shopaholic, as the sheer amount of shops it hosts - and the scale of those shops, is pretty phenomenal. 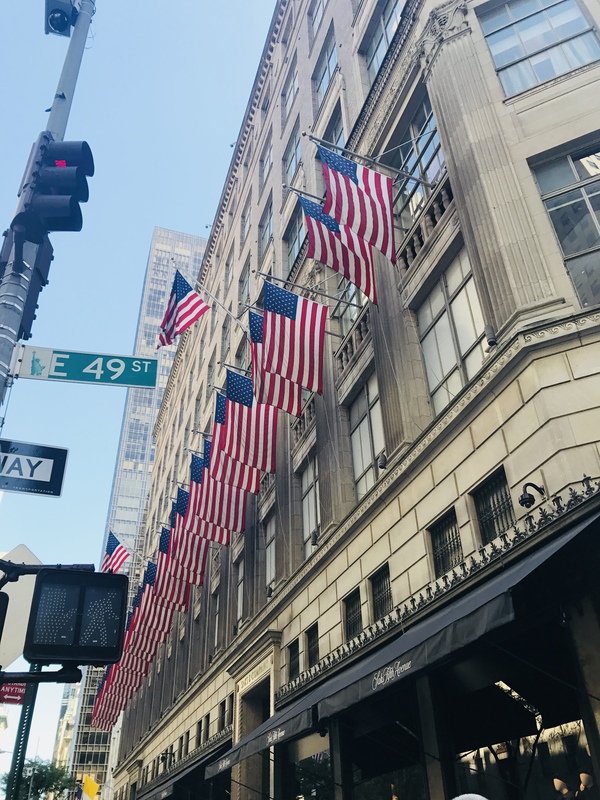 I had to pop into Saks 5th Ave for a girly shopping morning (note: the morning is a perfect time to swing by as it's quieter) in the beauty and fashion departments. I popped into Givenchy and they had the newest collections before it had hit Harrods or online. I have to say, the new Antigona's are so incredibly tempting. But no, I repeat, MUST SAVE FOR HOUSE. Sephora is also a very exciting staple on your shopping expedition. I managed to pick up the new range from Tatcha, a new-on-the-scene Japanese skincare brand which are usually sold out all over the states because their products are incredible at tackling irritation and soothing skin. I stocked up on the Water Cream, which feels like silk and creates a hydrating film - perfect for layering on a flawless make-up base. And also the Rice Enzyme Exfoliating Powder which is the most gentle, calming exfoliant which perfectly removes dead skin cells without stripping your skin and leaving it red raw. I rarely get MEGA impressed, but I was. Don't miss out on: Macy's, Bloomingdales, Century 21, Bedford Avenue, Madison Ave, Soho, Barneys NY, Lord & Taylor, Nordstrom Rack. New York offers tonnes of choice in the way of accommodation and so it totally depends on your budget, your requirements and where you'd like to have your base. I'm going to be totally honest here and say that I feel really disappointed in my choice of hotel. As I was visiting on my own (which is pretty scary as I'd never been before), I wanted somewhere super central and well-known. So I opted for the Crowne Plaza Times Square. Location wise, I really can't fault it, as you literally step out of the door and you're right in the heart of the action, in Times Square. Everywhere is a very short walk away and it made it very easy for me to navigate the city, even as a novice New Yorker. However there's where the impressive qualities end unfortunately, as the rooms are relatively comfortable but pretty tired - especially for the money you're paying. I stumped up $1800 for five nights, however they failed to tell me at check in that there would also be city tax and hotel taxes added to the bill - so I was very upset to find the $460 was then added to my total, which is obviously a huge extra expense that I hadn't accounted for and couldn't really afford if I'm totally honest. There was a bit of an irritating incident with some bites on my arms and legs, which to their credit - they did investigate. And the maid service kept bursting in unannounced early in the morning when I was showering, which was a little bit unnerving. But anyway, I'm not out to bash the hotel, because everyone has different experiences and I appreciate mine may have just been a one-off. It was disappointing but one of those things I suppose and I feel lucky I was able to make the most of my trip, regardless of this. I wanted to be honest, just in case you're planning a trip of your own, as obviously the accommodation is probably the most expensive part and you want it to add to your overall experience rather than detract from. So, because I've been a little bit unhelpful on this front - below are a few recommendations from friends and fellow bloggers! Ooh and just to note, you won't find any Air BnBs in Manhattan as they've phased them out now - but you could stay in New Jersey which is just across the river and a short metro ride into the city, for a cheaper option! The Row, NY - if you've ever been to New York and strolled along 8th Ave, then you'll probably have spotted The Row's iconic doorway - dotted with lights and with a swanky modern exterior. It's obviously super central and it's very chic, with extremely welcoming doormen who offered to help me with a few bags - even though I wasn't even staying there! Gramercy Park - this is the ultimate luxury and super swanky, so the price tag matches this - however if you're looking to really make the most of your trip in the city, this is definitely somewhere to consider. Yotel - this one is a super affordable option in a fabulous location. A couple of friends have raved about this place, famed for it's small but perfectly formed rooms. Don't be fooled, you won't have tonnes of space to unpack your case but it's great if you want to make your budget stretch and make the most of the city! Plus it's clean, sleek and modern! Have you been to New York recently? Do you have any travel tips you can add - or are you planning your next trip? Norwegian is continuing the expansion of its trailblazing long-haul network with the launch of a second daily flight to JFK commencing 10th August. The additional service will allow passengers to arrive into JFK first thing – perfect for a day of sightseeing or business meetings.